What are Products & how do I create them? What do I do with Products? Subscriptions on VHX allow you to charge your customers on a recurring monthly and/or yearly basis for streaming-only access to your video content. You can add new videos as often as you want. You control the branding, organization, and pricing! You can see a detailed guide on setting up your subscription here: How do I sell Subscriptions? Purchase - After buying, the customer OWNS this product. They get unlimited streaming access, and can download it if you have that set. They can login anytime later to watch. 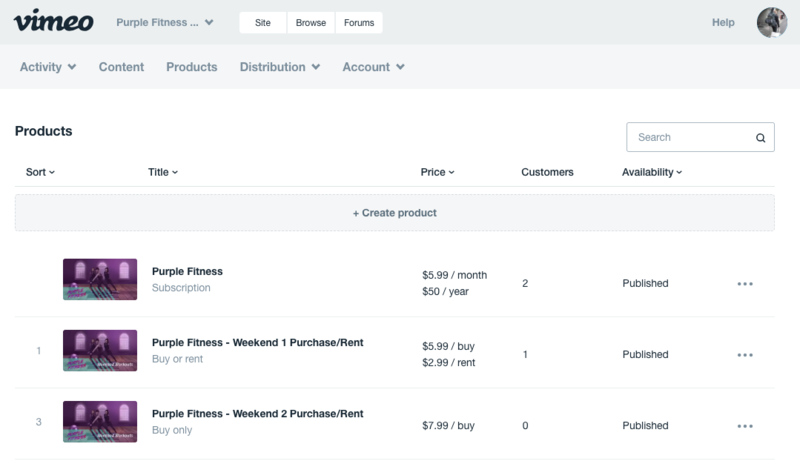 Here's how to create: How do I create a Purchase / Rental Product? Pre-orders - For Purchase Products, you can enable Pre-orders. This allows you to collect payment prior to having the content ready to watch. Rental - Think about the classic video store experience: rent videos for a limited amount of time, at a lower price point. You can offer your own digital rentals as another option for customers to watch your videos. All rented videos are streaming-only, and access lasts for 3 days from the beginning of watching. Read more here. Organize videos into playlists, series, or movie collections - When selling subscriptions with lots of content, Collections lets you organize how you wish! Price your work - Creating a Product is also where you set the price of your content. Read our guide on pricing your work. Offer free-trials - When selling a subscription, you can enable free-trials for a lower barrier to entry for your audience. Run a pre-order - Pre-orders allow your audience to buy your film before it's released! You can also give them instant gratifications for pre-ordering. Read our guide on creating a pre-order Product here. Embed a Product on an external website - With a buy form OR a trailer & buy button on an external site. Read our guide on this here. Include non-video bonus content - You can include other downloadable content like a soundtrack, PDF booklet, or photos within a Product. That content will show on the watch page of your site if the customer purchases that Product.